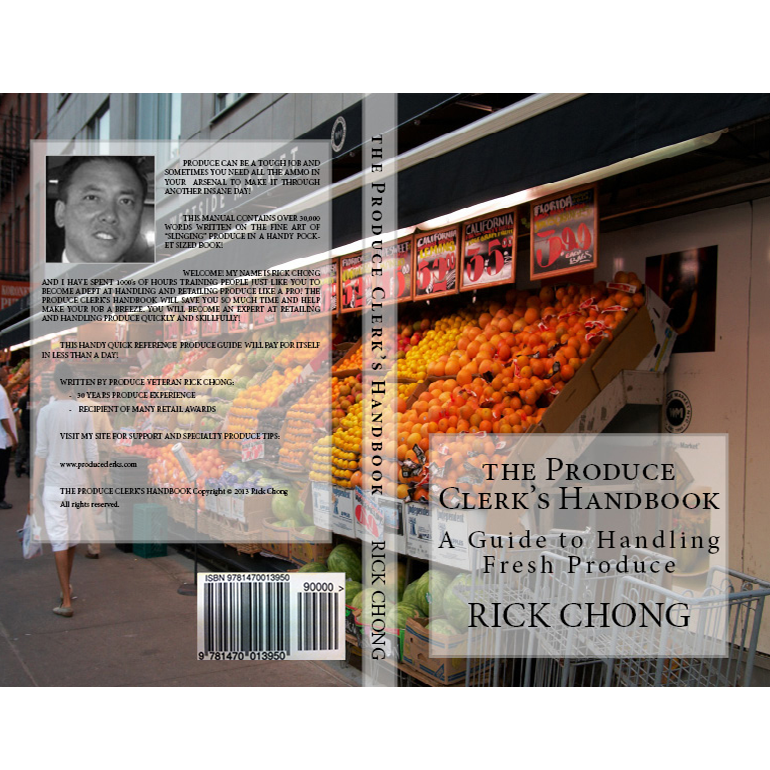 My name is Rick Chong and I have spent 1000’s of hours training people just like you to become adept at the fine art of “slinging” produce. 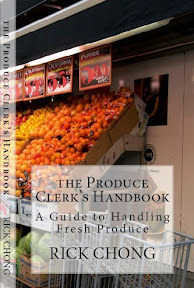 The Produce Clerk’s Handbook will save you so much time and help make your job a breeze. You will become an expert at retailing and handling produce quickly and skillfully. Produce can be a tough job and sometimes you need all the ammo in your arsenal to make it through another insane day! THIS HANDY QUICK REFERENCE GUIDE WILL PAY FOR ITSELF IN LESS THAN A DAY! I have kept the cost of this book inexpensive and affordable. Please respect my Copyright and recommend this book to your co-workers and friends if it has helped you. Thanks in advance. I welcome all questions and comments, positive and negative. Your feedback will help make the next edition a better tool for everyone. Receiving poor quality produce can be just the start of a bad day if it is not caught and proper store protocols followed. Otherwise it will mean more work for you and everyone else in your department, and your customers will not be happy either. 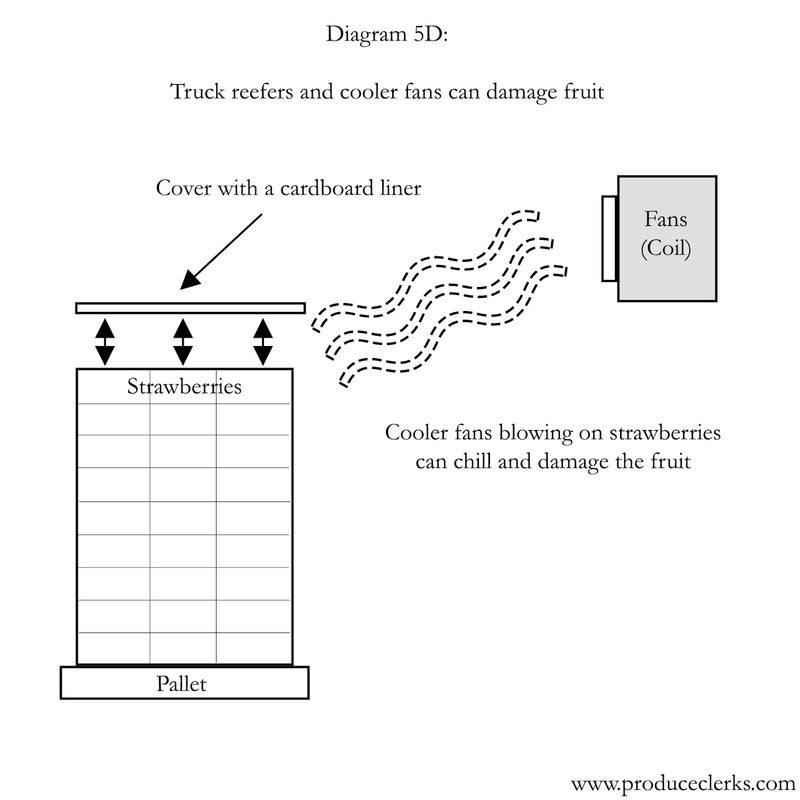 You should feel confident and at ease when you are receiving and inspecting produce. Develop a routine and change it up once in a while as you become more adept. Whenever possible, produce should be inspected at waist-high level. Try not to put undue stress on your back. Use a produce-cart, stack a few empty banana boxes to use as a table, or something similar. Pallets should arrive properly wrapped, strapped or both. This is a good sign that proper procedure was being followed at origin. Product that has shifted on the pallets is usually caused by the truck driver taking a corner too quickly or applying the brakes too hard. 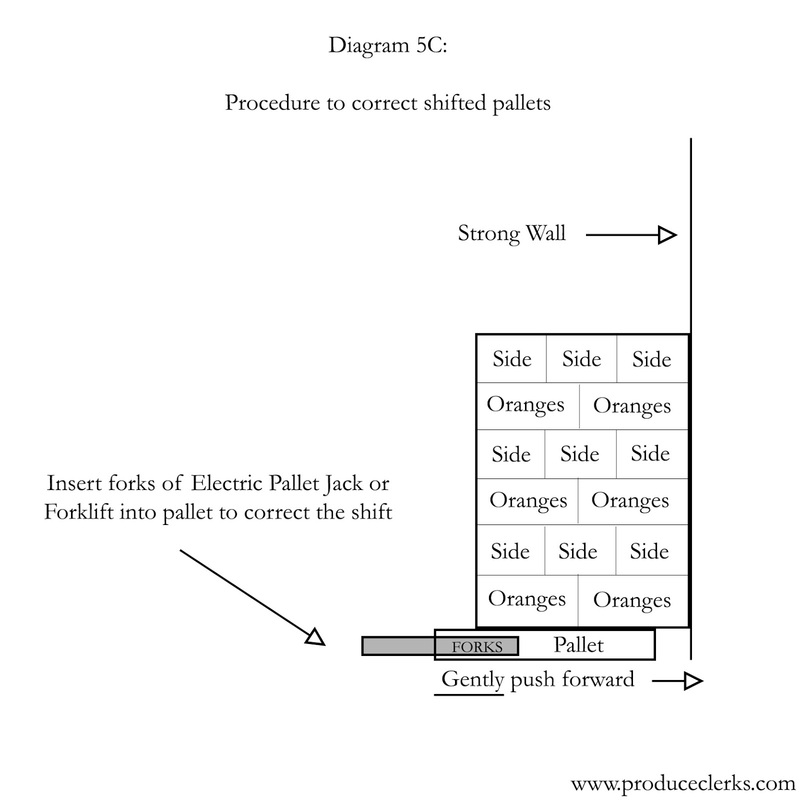 The procedure outlined in Diagram 5C will save you the trouble of having to restack pallets. The majority of the time this procedure can be used quite effectively. Signs of sweating or condensation on the pallet wrap is an indication the produce was sitting out at room temperature too long; or the truck driver had his reefer turned off to save fuel. In this situation, you need to inspect the pallet(s) closely and check the pulp temperatures. If you decide to accept the shipment, record your concerns on the Bill of Lading in case a claim is required later on. Chilling is also a common problem when you are receiving produce. The truck reefer can easily chill some types of fruit and veggies if they are loaded too close to the reefer. Apricots, asparagus, strawberries and cherries are just a few of the commodities that chill easily. Either by the truck reefer or the cooler fans at the warehouse blowing directly onto the products. 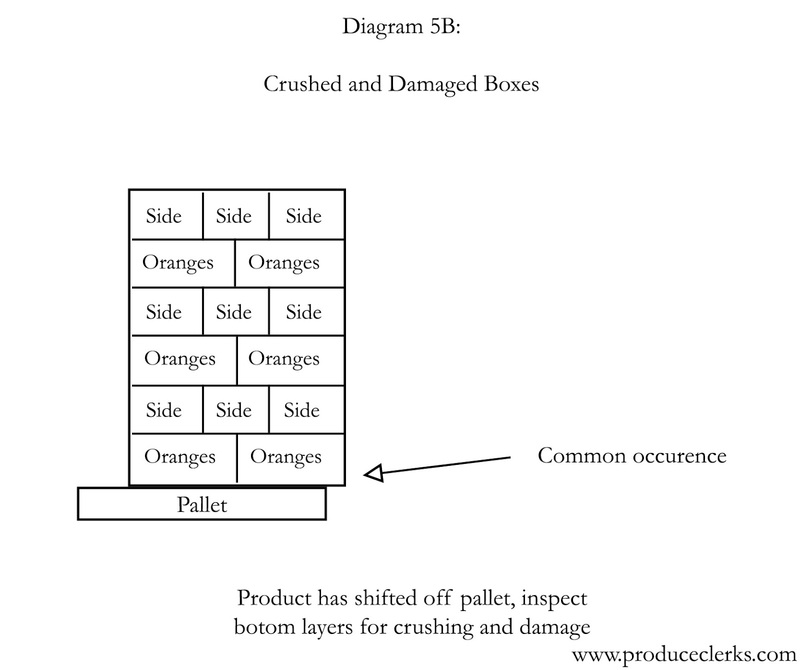 Placing a cardboard liner (Diagram 5D) on top of the pallet will prevent this. Sometimes your level of expertise will be challenged by truck drivers, shippers and growers. Understanding the causes that affect quality lends you a level of credible professionalism that cannot be argued. 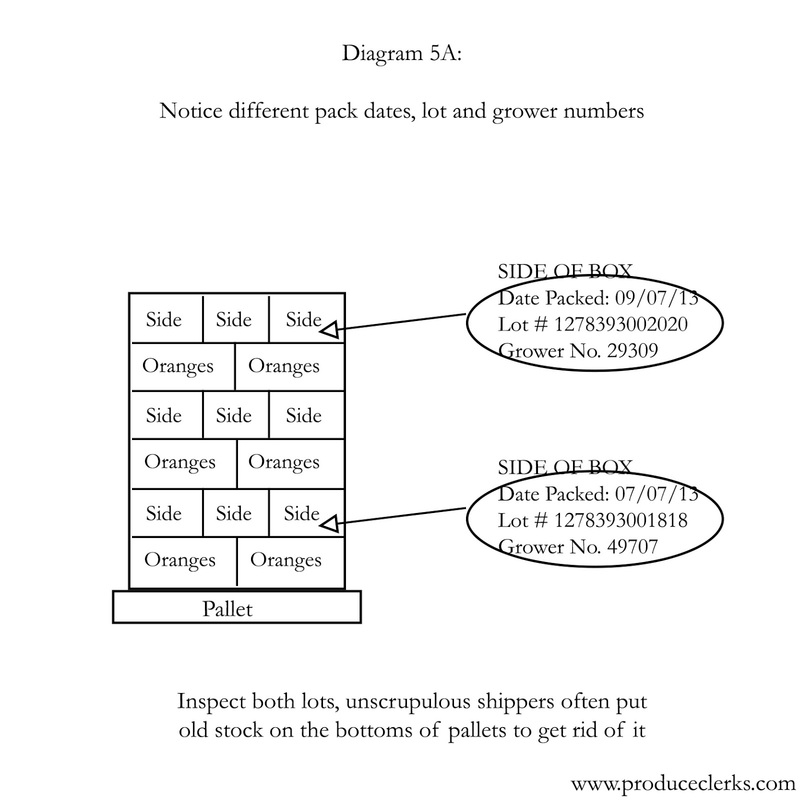 As outlined in Diagram 5A, always remember to check the Date packed, Lot Number and Grower Number. Often unscrupulous shippers will retag old product with new labels and/or put old stock on the bottom of pallets, hoping you will be too dumb to notice or lazy to check. Rejecting shipments with an accumulation of more than 10% defects is a guideline only, use your own judgment. Forklifts and power jacks (electric pallet jacks) make the perfect tools to effectively unload, receive and put away your produce orders. You can save yourself several hours of heavy lifting a week. Learning to use this equipment is quite easy and maintenance is very minimal. You may be required to take a forklift class before you are certified to drive this machinery. Besides recharging the batteries usually once daily, you need to check the water level in the batteries every couple of weeks and refill whenever necessary. Having scheduled deliveries and/or mandating drivers must call ahead to notify you of their ETA is a real godsend. This allows you ample time to ensure the equipment is charged and ready-to-use. Ask drivers to help you restack boxes, unload or put away pallets in the cooler. The old saying “You scratch my back and I scratch yours” comes into play and means… I will occasionally let the odd mistake slide without consequence. It’s always wise to be friendly and non-confrontational. Don’t be a hardass unless all else fails. White Asparagus: Highly perishable, avoid unnecessary handling. Touching stalks will cause them to snap. Display packaged if possible to avoid losses. Cover at close to avoid stalks turning green (like potatoes). When will your handbook be ready to purchase? Thanks so much for visiting my site. I am currently in Chile packing cherries. I hope to have my handbook completed by the end of January or February. Any news on that handbook? I'd love to buy! I started working at a local super market last July as a cashier and they moved me to produce a month later. Short staffing puts a large workload on myself and my manager and I try my best to get stuff done. Just found your site tonight, gonna dig through it. Hope your still looking to make a book. I am working on completing this book by the end of this month (March, 2013). I have been too busy managing our cherry operations for the past 2 years as our company continues to grow phenomenally. But I have taken off the next few weeks to get this done. Thanks for your comment and visiting my site! Is your book out yet if so email me @ alexandersolisbhr@yahoo.com thank you .